Mary Anne Zamit responded to a call for essays on African Issues in the Past, Present and Future by the Volta Times and contributed this piece on immigration in Malta. She comes from Malta, a region in the Mediterranean where North African immigration has become an everyday reality. Most immigrants there are from Africa and often risk their lives making the unforgiving voyage. She writes to describe recent events in Malta where 300 people lost their lives. The Mediterranean Sea has for ages bustled with commerce since prehistoric times when trade between Africans, Europeans and Arabs flourished along the vast coastline. It was considered a beautiful jewel, not only for commerce but for the peace and the hope that it inspired in people from all walks of life. Now, it has become a morbid cemetery for many people of all ages. Most of these victims are however African migrants, whose homes are torn by war or a lack of viable opportunities, and who hope for a better life in the distant European plains. However, their hopes are dashed by this very Mediterranean Sea and their lives vanish into the deep waters of the bottomless abyss that hopelessness brings. Women, men and even children have been lost at sea. But these tragedies have been going on for years, which makes you wonder why nothing has been done about it. In the last two years the situation has gotten much worse. In fact, just when 2015 turned, we witnessed one of the biggest tragedies yet, and it will be remembered as the worst year of tragedies in the Mediterranean region as a whole. Sometime in January, The United Nations Refugee Agency reported an observable increase in the number of migrants leaving the African shores by boat into Europe. The Agency estimated an increase of more than 60 percent. During the second week of February, with temperatures plunging to some of the lowest we’ve had, about 300 Africans lost their lives. They too, like some of their predecessors took the risk to cross the Mediterranean from North Africa towards the European country of Italy. They traveled on makeshift boats – rubber boats – and unfortunately died frozen. The deaths added to another 29 Africans, between the ages of 18 and 25, who were reported a week earlier to have died off the Italian coast from hypothermia. The migrants are said to have departed from a base in Libya. No matter how perilous these journeys may be, people seem bent on trying to enter the European Union at all costs. Perhaps to escape strife, poverty and persecution. The recent tragedy is not isolated. Last year, more than 300 African migrants were shipwrecked on the Italian island of Lampedusa. These recurrent tragedies, no matter how devastating they are do not seem to discourage migrants from taking the risks. Yet, what is more appalling is the fact that little has so far been done to save lives. The reoccurring tragedies in the Mediterranean region has seen new humanitarian organizations form. The Mare Nostrum (Our Sea) was launched in 2013, involving the Italian rescue ships close to the Libyan coasts, with the aim of saving lives but was criticized for actually encouraging migrants to embark on the dangerous voyage. It was phased out since November 2014. It seems to have been replaced by the Triton mission which now operates a few miles off the coast of Europe and aims to patrol the European border. However the Triton mission has also come under criticism. Several NGOS in the region claim that the mission in itself is not being directed towards search and rescue but rather to prevent Africans from entering Europe. It has been estimated that during the last two decades, between 17,000 and 20,000 migrants have lost their lives at sea. 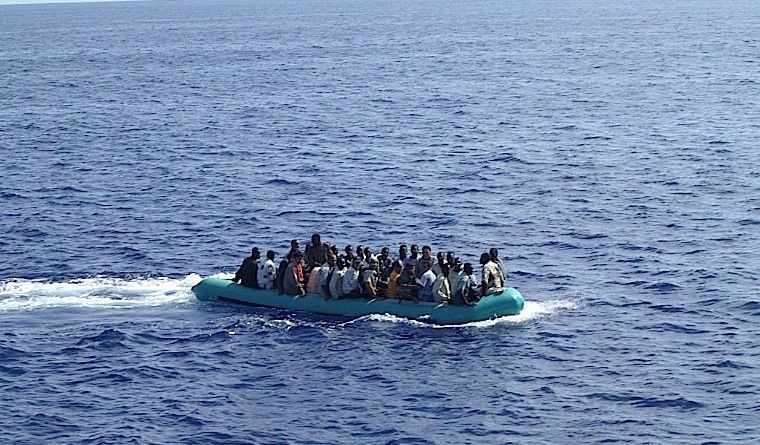 Additionally, out of this increasing rate of voyages into Europe from North Africa has emerged new routes for smugglers who take the opportunity to make huge profits in the transportation business of carrying fellow Africans in rubber boats across the Mediterranean. According to the European agency Frontex, smugglers are syncing the exact time of the illegal crossings with the actual departure of cargo ships across the Mediterranean. These ships are obliged to rescue migrants under the obligations of Maritime International Law. Some reporters have also said that smugglers are also using old freighters and cargo vessels for transporting larger numbers of people into Europe and then abandoning them in territorial waters to fend for themselves. Notwithstanding these threatening situations, people are still willing to pay loads of money to these smugglers in order to get into Europe. Malta and Italy are the popular destinations for first time migrants. About 90 percent of the people who land in Malta throughout the year come from Somalia and Eritrea. Under International Law, states countries are obliged to give protection and offer territory to migrants. Additionally, migrants are taken to secure detention until their identities are clarified. However, the process in itself can take several months and often people end up stuck on the island for months on end. Once their identities and origins are clarified the migrants are then allowed to live in the community. In most of the cases they manage to integrate and also find jobs but this is also at their own costs. There are circumstances where African migrants work for long hours under very precarious conditions. The Islamic State seem poised to take advantage of these voyages. ISIS has already threatened to send a large number of people towards Italy. This means that more Africans might risk their lives in trying to join in on such voyages across the Sea in Europe, further complicating the already tense situation. It seems expedient for the European Union and the African Union to rise to the task to put an end to these voyages, especially now that ISIS has threatened to use it as their own conduit into Europe. A collective response policy coordinated amongst the European Union, the African Union and the International community will go a long way to save African lives and prevent ISIS members from going through Africa into Europe. In addition, it would be important for European and American interests which support bad governments in Africa to begin a moral check in the mirror. A complete removal of European and American interests in Africa, will ensure a stable Africa and put an end to such dangerous voyages into Europe by Africans. A case in point is Libya. Under Muammar Gaddafi, Libya remained a stable and a prosperous nation for more than 30 years, but has now become a nation stuck in civil war because the EU and the US wanted to support a bastardy opposition that had no business leading Libyans. If the Western imperialism in Africa stops, good governance in Africa will emerge, and voyages across the Mediterranean will come to an end. It is already late as many African lives have perished in the Mediterranean waters. Yet, it is still not too late to do the right thing! Never pay to cross the Mediterranean to your death! What sense does that make? Take the money and go back to your hometown and farm – absolutely nothing wrong with that. Paying to die is a traumatic experience even for the living. What at all is in Europe these people are looking for? What at all is over there except for racism and arrogance. Why cross the Mediterranean to your death. Oh brothers! Across the horizon is always greener! Or so they say. Well it seems all that is left in Europe for an African is a coffin, but if you manage to escape it, hell! Europeans pour into Africa without problem but they want to prevent us from pouring into Europe? Go to South Africa, Zimbabwe, Botswana etc. Europeans are enjoying life over there with their own businesses and land and farms. But we are prevent from entering Europe. Why? You say free trade, well this is what it takes. People must travel to and from in order to have free trade. No? Let African freely into Europe! Or stop us and we too will stop you from coming into Africa. The world is what is is – we are all humans!